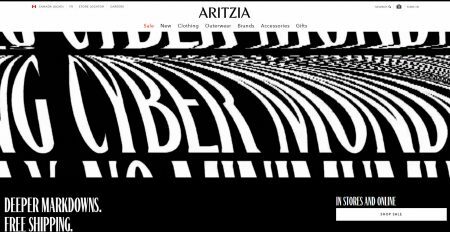 Aritzia is having a 1-day only Cyber Monday Sale. Save up to 50% off everything + free shipping on all orders. The sale is available in-stores and online on Monday, November 26, 2018 until 11:59pm PST. Prices as marked online reflect discount. Offer valid at aritzia.com from Sunday 25th November, 2018, 2:01pm PST through Monday 26th November, 2018, 11:59pm PST and in stores on Monday 26th November, 2018. Please note not all brands are carried at all stores. The Super Puff family is excluded from this promotion. Offer cannot be applied to previous purchases or the purchase of gift cards and cannot be redeemed for cash. Terms of offer are subject to change. Canada only. Click here to shop Aritzia online or for more details about the sale.